The hosts (Sweden) and the defending champions (West Germany) qualified automatically. Of the remaining 14 places, nine were allocated to Europe, three to South America, one to North/Central America, and one to Asia/Africa. Aside from the main European zone matches, Wales, which finished second in its group behind Czechoslovakia, was drawn into a play-off with Israel after Israel won its group by default because its three opponents, Turkey, Indonesia and Sudan, refused to play. FIFA had imposed a rule that no team would qualify without playing at least one match, something that had happened in several previous World Cups. Wales won the play-off and qualified for the first, and so far only, time. With Northern Ireland making its debut, and England and Scotland also qualifying, this World Cup was the only one to feature all four of the United Kingdom's Home Nations. This World Cup also saw the entry and qualification of the Soviet Union for the first time, while Argentina appeared for the first time since 1934. Until 2018, this FIFA World Cup was the only one for which Italy failed to qualify (Italy did not take part in the 1930 tournament but there was no qualification for that competition). Other teams that failed to qualify included two-time champions and 1954 semifinalists Uruguay, as well as the Spain and Belgium national teams. On 8 February 1958, in Solna, Lennart Hyland and Sven Jerring presented the results of the draw where the qualified teams were divided into four groups. Seeding was geographical rather than by team strength, with each group containing one western European team, one eastern European team, one of the four British teams that had qualified, and one from the Americas. The format of the competition changed from 1954: 16 teams still competed in four groups of four, but this time each team played each of the other teams in its group at least once, without extra time in the event of a draw. Two points were awarded for a win and one point for a draw. If the first two teams finished on equal points then goal average would decide who was placed first and second. As in 1954, if the second and third placed teams finished on the same points, then there would be a play-off with the winner going through. If a play-off resulted in a draw, goal average from the group games would be used to determine who went through to the next round. If the goal averages were equal then lots would have been drawn. These arrangements had not been finalised by the time the tournament started and were still being debated as it progressed. Some teams complained that a play-off match, meaning three games in five days, was too much, and before the second round of group matches FIFA informed the teams that goal average would be used before resorting to a play-off. This was overturned when the Swedish Football Association complained, ostensibly that it was wrong to change the rules mid-tournament, but also because it wanted the extra revenue from playoff matches. Almost all the matches kicked off simultaneously in each of the three rounds of the group phase, as did the quarter-finals and semi-finals. The exceptions were Sweden's three group matches, all of which were televised by Sveriges Radio; these started at other times so Swedes could attend other matches without missing their own team's. Apart from these, one match per round was televised, and relayed across Europe by the European Broadcasting Union (EBU). Many Swedes bought their first television for the World Cup. The official ball was the "Top-Star VMbollen 1958" model made by Sydsvenska Läder & Remfabriks AB (aka "Remmen" or "Sydläder") in Ängelholm. It was chosen from 102 candidates in a blind test by four FIFA officials. In Group 4, Pelé did not play until the last of Brazil's group games, against the Soviet Union. He failed to score, but Brazil won the game 2–0 (much thanks to an impressive exhibition of dribbling prowess by his partner Garrincha) and the group by two points. Previously, they had drawn 0–0 with England in what was the first ever goalless game in World Cup history. Eventually, the Soviet Union and England went to a playoff game, in which Anatoli Ilyin scored in the 67th minute to knock England out, while Austria had already been eliminated. The English side had been weakened by the Munich air disaster earlier in the year, which killed three internationals on the books of Manchester United, including England's young star Duncan Edwards. Playoffs were also needed in Group 1 (Northern Ireland beat Czechoslovakia to join the defending champions West Germany in the quarter-finals) and Group 3 (Wales topped Hungary to advance with hosts Sweden). Hungary had become a spent force after their appearance in the final of the previous tournament. They had lost their best players two years before, when they fled in the wake of the failed uprising against the communist regime. In a rather restrictive sense, from the 1954 team, only goalkeeper Gyula Grosics, defender Jozsef Bozsik and forward Nándor Hidegkuti remained. The quarter-finals saw France's Just Fontaine continue in similar form as in the group stage, managing another two goals as France triumphed over Northern Ireland. West Germany's Helmut Rahn put them into the semi-finals with a single goal against Yugoslavia, while Sweden went through at the expense of USSR. The other game in the quarter-finals saw Pelé score the only goal against Wales. 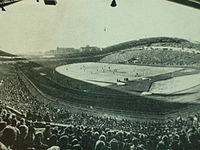 The final was played in Solna, in the Råsunda Stadium; 50,000 people watched as the Brazilians went a goal down after four minutes. However Vavá equalised shortly afterwards and then put them a goal ahead before half time. In the second half, Pelé outshone everyone, notching two goals, including the first one where he lobbed the ball over Bengt Gustavsson then followed it with a precise volley shot. Zagallo added a goal in between, and Sweden managed a consolation goal. The Final saw many records made in World Cup history that still stand as of 2014[update]. At age 17, Pelé simultaneously became the youngest player to participate in, score, and win a World Cup Final. Conversely, Nils Liedholm became the oldest player to score in a World Cup Final at 35 years, 263 Days. This final had the highest number of goals scored by a winning team (5), the highest number of total goals scored (7), and together with the 1970 and 1998 finals shares the highest goal margin of difference (3); Brazil played in all those three finals. The game is also notable for many firsts in FIFA World Cup. With the exception of the 1950 FIFA World Cup final group stage, this marked the first time that a World Cup host reached the final without winning it. Additionally, the match marked the first time two nations from different continents (Europe and South America) met in a World Cup final. It also marks the first and only World Cup hosted in Europe not won by a European team; a feat mirrored in 2014 where a World Cup hosted in the Americas was not won by a team from the Americas for the first time, with Germany beating Argentina 1-0 at the final. A total of twelve cities throughout the central and southern parts of Sweden hosted the tournament. FIFA regulations required at least six stadiums to have a capacity of at least 20,000. If Denmark had qualified, the organisers had planned to use the Idrætsparken in Copenhagen for Denmark's group matches. The Idrætsparken was renovated in 1956 with this in mind, but Denmark lost out to England in qualification. When doubts arose about whether funding would be forthcoming for rebuilding the Ullevi and Malmö Stadion, the organisers considered stadiums in Copenhagen and Oslo as contingency measures. The Rasunda Stadium was expanded from 38,000 for the World Cup by building end stands. Organising committee chairman Holger Bergérus mortgaged his house to pay for this. The new Malmö Stadion was built for the World Cup, replacing the 1896 Malmö Stadion at a new site The Idrottsparken had 4,709 seats added for the World Cup. The Social Democratic municipal government refused to pay for this until the organisers threatened to select Folkungavallen in Linköping instead. 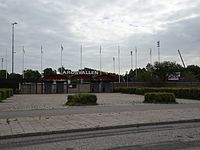 At the Rimnersvallen, a stand from the smaller Oddevallen stadium was moved to Rimnersvallen for the World Cup. The crowd at Brazil v. Austria was estimated at 21,000, with more looking in from the adjoining hillside. 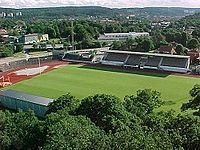 The most used stadium was the Rasunda Stadium in Stockholm, which hosted 8 matches including the final, followed by the Ullevi Stadium in Gothenburg (the biggest stadium used during the tournament), which hosted 7 matches. 22 match officials were assigned to the tournament to serve as referees and assistant referees. For a list of all squads that appeared in the final tournament, see 1958 FIFA World Cup squads. Although Just Fontaine got more votes than any other forward, they were split between the left and right inside forward positions. The West Germans, surprise world champions four years before, were still very strong, and fielded an exciting young forward in Uwe Seeler. But this time the Germans had to contend with a real powerhouse in Argentina's team, competing for the first time since 1934. In fact, some experts[who?] thought Argentina had a very realistic chance of reaching the semi finals or even winning the World Cup this time. 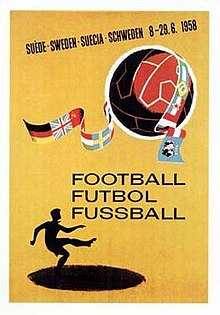 Czechoslovakia was a fairly strong team with a rich football tradition, and was considered to be no walk-over for the West Germans or the Argentinians, but nobody expected much from tiny newcomers Northern Ireland. But the Northern Irish had already shown that they could be a danger to anyone, by knocking out double world champions Italy in the qualifying tournament for the World Cup. In the end, the Northern Irish did pull off one of the biggest upsets in World Cup Finals history by qualifying for the quarter-finals, beating Czechoslovakia in a play-off. Finishing last in the group with a −5 goal differential was a horrible blow for Argentina, and on the way home the Argentinian team met the wrath of several thousand angry football fans at Ezeiza Airport in Buenos Aires. The second group saw the largest number of goals scored in a single group in the 1958 World Cup with 31 goals in total (~5.16 goals per game). Just Fontaine of France scored 6 of his 13 goals in the tournament, making him the tournament's top scorer going into the quarter-finals. None of the teams in this group had been particularly successful at previous World Cups. France, despite having hosted the 1938 event, had not achieved any real World Cup success, Yugoslavia had not been able to replicate their semi-final success of 1930 and Paraguay and Scotland were considered underdogs during the tournament. France won the group ahead of Yugoslavia and would go on to finish third. The Swedish hosts could count themselves lucky in ending up in a rather weak group which they proceeded to win fairly easily with their powerful workmanlike football. The group included Hungary which had been considered by far the best team in the world some years ago – although the Hungarians could not beat West Germany in the final of the World Cup in 1954. But the Hungarian team had been dealt a blow by the Hungarian Revolution of 1956 after which star players like Sándor Kocsis and Ferenc Puskás left their homeland. Striker Nándor Hidegkuti was still playing, but he was by now 36 years old and nowhere near his previous form. In spite of Hungary's recent travails, they were still considered a strong side and everyone expected the Hungarian players to advance from their group. The success of Wales therefore was a great surprise but the Welsh managed to draw all the group games and then beat the once-mighty Hungarians in a play-off match to decide which nation should follow Sweden into the knock-out stage. Had goal difference been the decider, Hungary would have gone through as the Hungarians had a goal ratio of 6–3 compared to 2–2 of Wales. As it was, Wales had the honour of meeting Brazil in the quarterfinals and becoming the recipient of young Pelé's first World Cup goal. The 1–1 draw between Wales and Mexico was the first point scored by Mexico in a World Cup. The match between Hungary and Wales in Sandviken became the northern-most World Cup match in history. Notwithstanding the disappointments of the previous tournaments, Brazil were considered extremely powerful, as would indeed prove to be the case. The Soviet Union were the reigning Olympic champion and Austria had won the bronze medal in the 1954 World Cup in Switzerland, four years earlier. And although England, weakened by the loss of several players at the Munich air disaster, were not considered at their very best, they were still always a formidable team. In the end, this group had the highest average attendance, even higher than Group 3 with the host nation, Sweden. The quality of the football in this group did not quite live up to expectations, however. Only 15 goals were scored in the whole group, fewer than in any of the other groups. And when England and Brazil drew 0–0, it was the first time in World Cup history that a game ended with no goals. Brazil won the group without conceding a single goal. The teenage Pelé played Brazil's last game against the Soviet Union. He did not score but drew wild reviews for his play. The Soviet Union, in their first World Cup, took second place. With 13 goals, Just Fontaine was the top scorer in the tournament. As of 2018[update], no player has ever scored more goals in a single FIFA World Cup Final stage. In total, 126 goals were scored by 60 players, with none of them credited as own goal. Norlin, Arne (2008). 1958: När Folkhemmet Fick Fotbolls-VM (in Swedish). Malmö: Ross & Tegner. ISBN 978-91-976144-8-1. ^ "FIFA World Cup: host announcement decision" (PDF). FIFA. 12 March 2009. Retrieved 2 October 2011. ^ "Top Star 1958". balones-oficiales.com. Archived from the original on 2 April 2012. Retrieved 17 September 2011. ^ Mundo Deportivo, 23 June 1958; El Grafico, 27 June 1958. ^ "Players - Top goals". FIFA. Wikimedia Commons has media related to FIFA World Cup 1958.